The Exhibits Department of the Southwest Collection/ Special Collections Library researches, designs and fabricates exhibits to highlight the vast holdings of the Archive, incorporating photographic imagery, artifacts, documents, sound and assorted other materials as well as textual information. Exhibits are displayed in the Southwest Collection/ Special Collections Library. You may also view our exhibits at the Tech Club, the United Supermarkets Arena, and at the Lubbock International Airport. 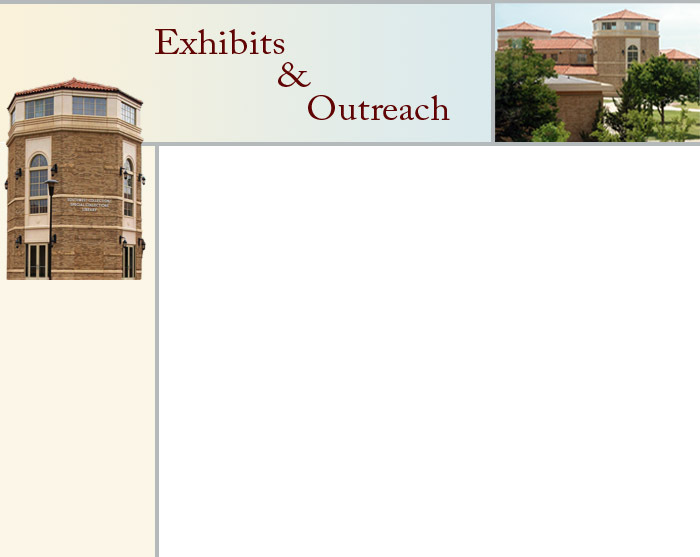 If you would like to propose an exhibit, please contact Lyn Stoll at (806) 742-3749 or write to lyn.stoll@ttu.edu.